WOW! I haven’t written in almost a month! That is OUTRAGEOUS! Life is super busy with a one year old. Let’s get on with the updates! At the beginning of this month, we took Little Man to see the Easter Bunny. 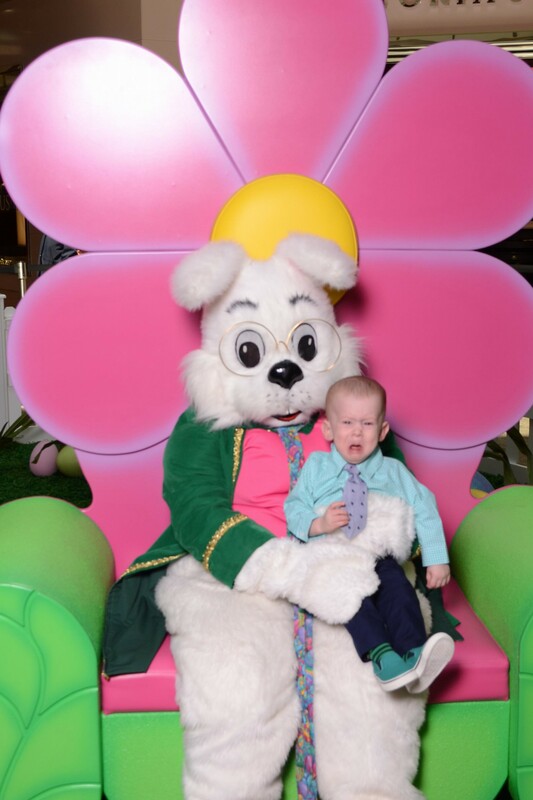 He was NOT happy at all. The photographer got a progression of his emotions. We ended up getting the grumpy face picture printed off. He looks so sad in all of them, we figured that one was the least pathetic. Easter weekend wasn’t as busy as I thought it would be, which was great. Little Man now laughs at the most random things, fake laughs, stands by himself for long periods of time, and is working on drinking out of a regular sippy cup. He hasn’t grasped the fact that it has to be tipped up. Oh! Something super exciting should be starting any day now. He’ll be starting early head start! I’m super excited for him to learn and be around kids his age. He’s only ever around me and he doesn’t know what to do around kids. Early head start has a weird schedule though. They get one week off for Christmas, one week off for Spring Break, and a four day weekend for Thanksgiving like other schools but they only get two weeks off in the summer! I find that crazy, but kinda cool. That’s all I have so far. I’ve heard Orange Is The New Black is good but I’m not sure yet. I’m hoping none of these shows get taken off of Netflix before I get to the or get to finish them. That would be TERRIBLE!